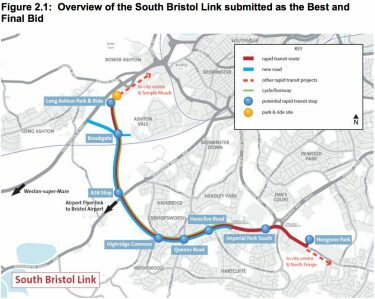 The South Bristol Link Road (SBLR) opened in December 2016. It has a parallel shared use path for pedestrians and cycles which connects at Long Ashton to the Festival Way (National Cycle Network 33). It then links at the other end to the Malago Greenway at Hengrove. There is a spur connecting through the Long Ashton Park & Ride to the maintenance track / cycleway alongside the guided busway between Long Ashton and Temple Meads. The Metrobus busway will overfly the Temple Meads to Portbury rail line at Ashton Vale on a new deck. The maintenance track / cycleway continues and terminates at Ashton Vale Road, where the railway is crossed by a level crossing (See sheet 201749-PA-908 at Travelwest https://s3-eu-west-1.amazonaws.com/travelwest/wp-content/uploads/2016/10/avtm-general-arrangement-plans.pdf). On the opening of the railway to passenger trains to Portishead (as part of Metrowest), it is currently proposed to close the level crossing (providing a new access from the west to the industrial estate). This will also close the public footpath crossing to Barons Close. 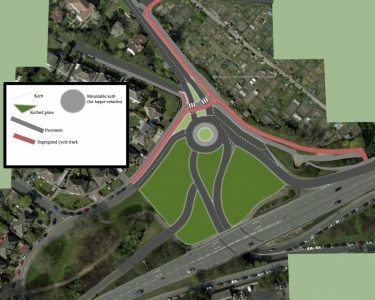 The current proposed route for cyclists and pedestrians between Ashton Vale Road and Winterstoke Road is a diversion of about 300 metres via a ramp to Ashton Road, and a convoluted series of crossings, ramps and subways, all of which fall short of current guidelines for such facilities due to gradients, and width. For cyclists travelling to South Bedminster / Ashton Gate, the diversion adds considerably to the journey time. Travelling towards the city, the route is much less attractive, more inconvenient and congested at peak times with school foot traffic. We have written to MetroWest as part of the ‘Ashton & Pill micro-consolation’ suggesting that the direct link between the Metrobus cycleway and Winterstoke Road is maintained by creating a subway under the railway at Barons Close. 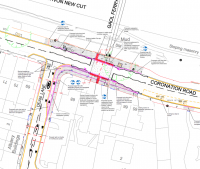 This would require onward facilities on Winterstoke Road to link to existing cycleways. PS There was a dramatic ‘Santa Cycle Ride’ in December 2016 to mark the opening of the SBLR. Check out the Flickr gallery. Southville Bridge abandoned – what’s next? One of the more iconic cycling schemes in the city has been abandoned (here and here). The Southville Bridge was approved in 2014 and would have linked Camden Road and through to North Street in Bedminster to the Harbourside. 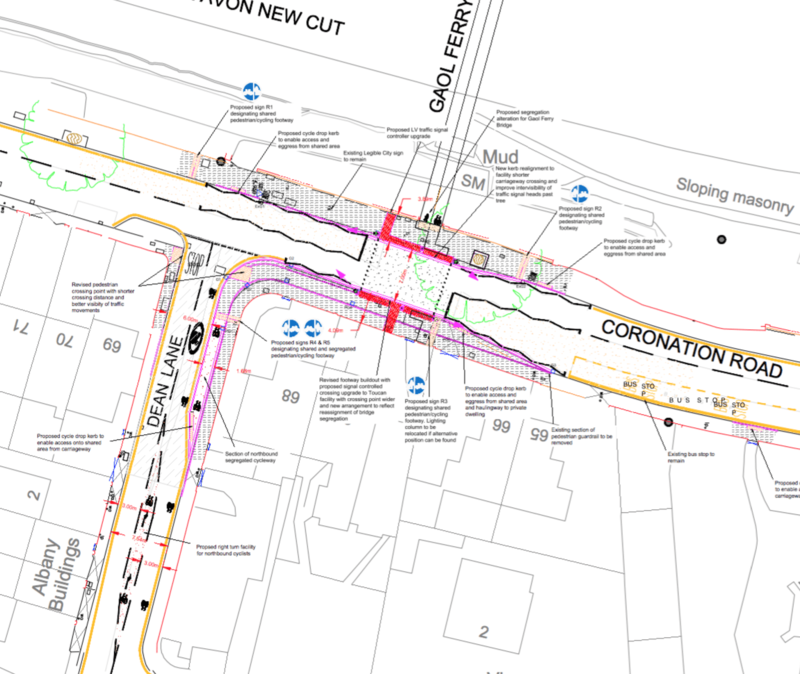 It remains an important part of the Greater Bedminster neighbourhood cycling plan. Costs had escalated alarmingly so Mayor George Ferguson pulled the project. The budget will be reallocated into other cycling projects and there has been agreement from DfT for an extended delivery timetable. Nevertheless, it is disappointing news that this useful link for one of the areas of the city with increasing numbers of people cycling. Gaol Ferry Bridge continues to have detours and poor provision for cycling during construction of Wapping Wharf. Merchant’s Dock improvements remain bogged down. This is what the council is proposing to redistribute funds to. Easton Way – extend the 5m wide segregated route to connect the Frome Greenway and the Railway Path. Cattle Market Road – part of the CAF2 bid but now in CAF1. But why is this not funded through the Local Enterprise Zone? Baldwin Street – to tie in the ends of this segregated route. Old City permeability – ‘traffic calming on Corn St’. WTF! 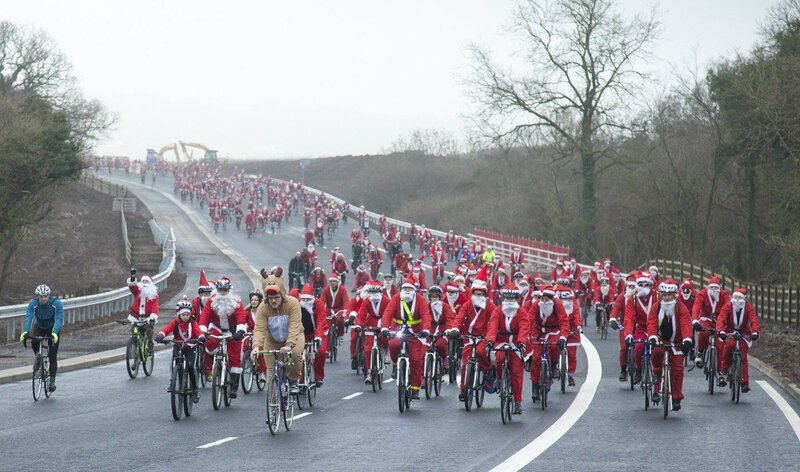 This comes at a time when it’s reported that the budget squeeze puts brakes on cycle safety pledge, while the Minister ‘hangs head in shame’ over British cycling provision, and yet George Osborne is told that investing in cycling will save £47 billion. There are a number of Community Speedwatch groups helping to make the 20mph areas in Bristol more effective. The group in Greater Bedminster is made up of BCyC members and they have shared the results of their observations. Figures from 2014 showed that 20mph limits were having an effect but with some specific problem areas. In 2015 over a thousand vehicles were checked with 14% going over 25mph (including one at 46mph!). There is a noticable improvement over 2014, however the threshold for recording has increased in 2015 from 24 to 26mph. The group is not going to monitor Raleigh Road any more as a new speed table appears to have had a significant effect. There are occasional training sessions run by the police for those who wish to join or set up a Speedwatch group. You can find out more from the police website.